קיים מגוון צום של מכשירי אנדרואיד בשוק: טלויזיות אנדרואיד, קופסאות טלויזיה, דונגלים וכיו”ב. על רבים מהם תוכנת השילוט של נוביסיין מסוגלת לרוץ ללא כל דופי. יחד עם זאת, המכשירים הבאים נבדקו לעומק במעבדתנו ואף הינם בשימוש של רבים מלקוחותינו ושותפינו. שותפים ולקוחות מוזמנים לשלוח לנו משוב על כל נגן אנדרואיד אחר שלכם ניסיון עימו. יצרני חומרה מוזמנים לשלוח לנו מכשירים לבדיקה. לשם כך, נא צרו עימנו קשר בדוא”ל info@novisign.com . * Minix Neo X7. Quad core Android TV box, 1.6GHz processor, 2GB RAM, 16GB ROM, Android 4.2.2, WiFi 802.11, Bluetooth 4.0, RJ45, HDMI, 3 x USB, micro USB/OTG, SD card slot, antenna, IR remote control. If you need screen rotation (displaying your signage in vertical portrait orientation), this one is our most recommended, but you will need to flash it with customized firmware. Using the firmware from 15-Oct-2014 and 11-Nov-2013 supports in watching at least 3 videos in parallel on the same screen (not including YouTube). Firmware from 1-May-2014 and 15-May-2014 support not more than 1 video on the same screen (not including YouTube) .Links: Product specifications, product unboxing, product firmware flashing (for rotation), auto power on jumpering. When using this device, please make sure the “Video To Video Transition” setting is set to “High Compatibility”. * EnyBox MK908. Quad core Android dongle, 1.6GHz processor, 2GB RAM, 8GB ROM, Android 4.2, WiFi 802.11, Bluetooth 3.0, HDMI, USB, micro USB/OTG, TF card slot. This one is our most recommended dongle. Using the firmware from 7-Mar-2014 supports in watching at least 3 videos in parallel on the same screen (not including YouTube). Links: product specifications, product unboxing. * Minix Neo X7 mini. Quad core Android TV box, 1.6GHz processor, 2GB RAM, 8GB ROM, Android 4.2.2, WiFi 802.11, Bluetooth 4.0, RJ45, HDMI, 2 x USB, SD card slot, IR remote control. If you don’t need screen rotation (displaying your signage in vertical portrait orientation), this one is our most recommended. Using the firmware from 26-Sep-2013 supports in watching at least 3 videos in parallel on the same screen (not including YouTube), but this firmware fits only older hardware. Firmware from 11-Feb-2014, 21-Feb-2014 and 11-Jun-2014 support not more than 1 video on the same screen (not including YouTube). Custom firmware from 6-Jun-2014 supports in watching at least 2 videos in parallel on the same screen (not including YouTube) and screen rotation (!). 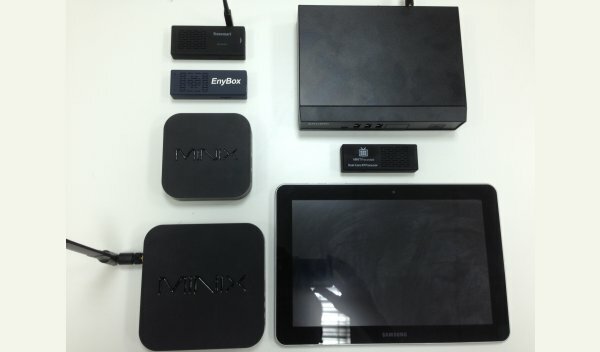 Link: Product specifications, comparison between Minix Neo X7 and Minix Neo X7 mini. When using this device, please make sure the “Video To Video Transition” setting is set to “High Compatibility”. * Tronsmart MK908II. Quad core Android dongle, 1.4GHz processor, 2GB RAM, 8GB ROM, Android 4.2, WiFi 802.11, Bluetooth 4.0, HDMI, USB, micro USB/OTG, TF card slot, antenna. Using the firmware from 12-Nov-2014 supports in watching at least 3 videos in parallel on the same screen (not including YouTube). Links: product specifications, product unboxing. * RKM Mini PC V5. Quad core Android TV box, RK3288 processor, 2GB RAM, 16GB storage, Android 4.4, 4K screen resolution, WiFi 802.11, bluetooth 4.0, RJ45, HDMI and 2 x USB. Using a firmware from 2016, it supports in watching at least 3 videos in parallel on the same screen (not including YouTube). Links: product specifications, product unboxing. * NTech Alexis AB-S905-4. Quad core Android TV box, A53 processor, 2GB RAM, 8GB ROM, Android 5.1.1 (tested well over firmware from 18-May-2016), WiFi 802.11, RJ45, HDMI, audio jack, 2 x USB, micro SD card slot, optical port, antenna, IR remote control. Supports screen rotation (portrait mode)! The above mentioned firmware supports not more than 1 video on the same screen (not including YouTube). Links: product specifications. When using this device, please make sure the “Video To Video Transition” setting is set to “Background”. * Giada Q30. Quad core Android TV box, 1.6GHz RK3188 processor, 2GB RAM, 8GB ROM, Android 4.4.2 (tested well over firmware from 4-May-2016), WiFi 802.11, RJ45, HDMI, audio jack, 3 x USB, RS232, TF card slot, 2 antennas. Supports screen rotation (portrait mode)! The above mentioned firmware supports not more than 1 video on the same screen (not including YouTube). Links: product specifications. * MXQ Pro (2GB). Quad core Android TV box, AMLogic S905 processor, 2GB RAM, 8GB storage, Android 5.1, support for 4K screen resolution, WiFi 802.11, RJ45, HDMI, 4 x USB, SD card slot, audio jack, AV jack, IR remote control and power supply. Current firmware supports not more than 1 video on the same screen (not including YouTube). Links: product specifications, product unboxing. When using this device, please make sure the “Video To Video Transition” setting is set to “Background”. * Minix Neo U1. Quad core Android TV box, Cortex A53 processor, 2GB RAM, 16GB storage, Android 5.1, 4K screen resolution, WiFi 802.11, bluetooth 4.1, RJ45, HDMI, 3 x USB, micro SD card slot, OTG, SPDIF, headphone jack, microphone jack, IR remote control, power button and power supply. Using a firmware from 2016, it supports not more than 1 video on the same screen (not including YouTube). Links: product specifications, product unboxing. When using this device, please make sure the “Video To Video Transition” setting is set to “High Compatibility”. היכן ניתן לקנות את נגני האנדרואיד הנ”ל בארץ? * אנא ודאו כי זהו “MXQ Pro” ולא רק “MXQ”. כמו כן, חשוב לוודא שזכרון ה – RAM הינו 2 גיגה ולא 1 גיגה. כדי להתקין ולקנפג את תוכנת השילוט הדיגיטלי של נוביסיין, נא הקלק כאן עבור הוראות.